Marguerite Caine’s physicist parents are known for their radical scientific achievements. Their most astonishing invention: the Firebird, which allows users to jump into parallel universes, some vastly altered from our own. But when Marguerite’s father is murdered, the killer, her parent’s handsome and enigmatic assistant Paul, escapes into another dimension before the law can touch him. Marguerite can’t let the man who destroyed her family go free, and she races after Paul through different universes, where their lives entangle in increasingly familiar ways. With each encounter she begins to question Paul’s guilt, and her own heart. Soon she discovers the truth behind her father’s death is more sinister than she ever could have imagined. The Firebird is a scientific marvel, a complex pendant allowing dimensional travel where Marguerite now finds herself hunting her father's killer. Paul Markov was undergraduate student, working under her father on the Firebird project, turning the dream of multidimensional travel into a reality. But only weeks after the project is proven a success, their laboratory is in ruin, data destroyed and her father killed by the person he entrusted into his home. But Marguerite isn't making the arduous journey alone. The charismatic and scientific genius Theo is determined to find Paul, his former friend that is the only suspect in the death of his beloved mentor. But it seems than Paul isn't escaping, but tracking a trail of deception throughout the dimensions, and Marguerite is one step behind. It isn't until the Firebrand breaks and Marguerite finds herself as the daughter of a Russian Tsar, that she begins to learn the truth. About the project, about Paul and the simmering passion she uncovers. 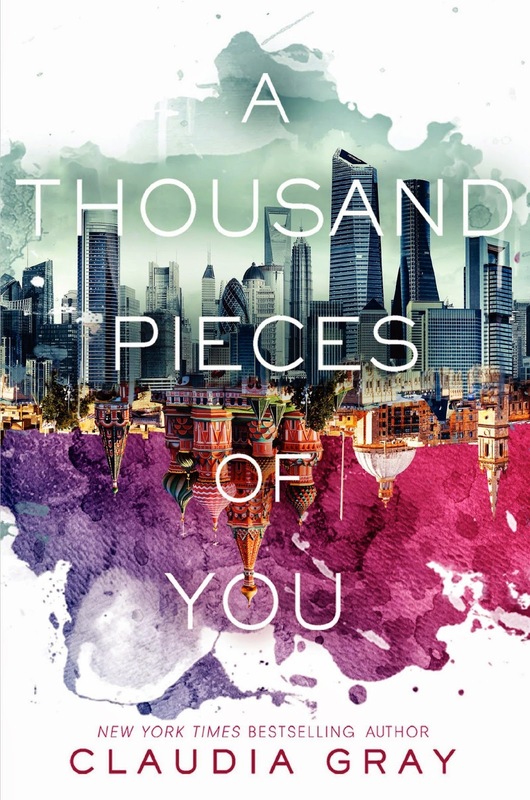 A Thousand Pieces of You is a a science fiction romance that will leave you utterly breathless. It was more than a science fiction thriller, but a sultry and intense romance. Reminiscent of Cristin Terrill's All Our Yesterdays, it follows the story of Marguerite, an artist amidst a family of scientific genius. Her parents both brilliant inventors, and has spent her seventeen years sharing her home with undergraduate students that her parents have taken in and nurtured. Including young protégés Paul and Theo. But when it seems her parents life work is destroyed, her father killed and Paul fleeing the scene with what he believes is the only Firebird prototype and has now become the only suspect... And Marguerite wants revenge. With Theo by her side, the two transport themselves throughout the dimensions. Only able to follow Paul into alternative worlds that where they already exist, Marguerite, Paul and Theo materialise into the body of their other self. It isn't until Marguerite finds herself as a Princess and daughter of a Russian Tsar, that she is forced to confront Paul. With her Firebird in ruin and Theo unable to jump into her world, Paul is adamant of his innocence. But if he didn't kill her father, than who did? It seems the lives of the Princess and her Lieutenant are heavily entwined and it isn't long before Marguerite finds old feelings beginning to resurface. But Theo can't be convinced of Paul's innocence and Marguerite begins to suspect that Theo's motives may not be seeking justice for her father's death, but proving Paul's guilt. It was beautifully written and a stunning blend of romance, science fiction and flourished with passion and suspense. The romance is sultry, intense and will have readers yearning for Lieutenant Markov. I'm curious to see what the second installment of the Firebird series will bring, as the conclusion of A Thousand Pieces of You felt befitting and complete. And that cover ain't half bad either. The romance takes center stage more so than the science fiction. It's not heavy with lots of blocks of information. It's more one of those fusion titles, not pure science fiction, because even I can't handle those. You should give it a try Joy. That cover could be framed. Oh Jess, how I love watercolours. Now I sound super dramatic. That's totally your fault. Coming in here bouncing off the walls at 5am. Wonder when they'll release the cover, and can we somehow take the artist hostage. I LOVE PARALLEL WORLDS. I've been seeing mixed reviews here and there, but I'll pretty much listen to anything and everything you say Kelly, so yes I will pick this up one day. Also THAT COVER! I do too! That cover, my goodness it's just so incredibly pretty. It's well worth buying, especially if you've read and loved All Our Yesterdays. This is the epic romance version. I liked this one a lot. I often have issues with romances in parallel universe books, and that was a bit of a problem for me here, but I still enjoyed this overall! So many readers have had the same issue it seems Jen, you're definitely not alone. Do you think you'll be continuing on with the series? I thought book one wrapped up pretty nicely, so I'm really curious to see what book two will be about. And also see that cover. It looks like you might be in the majority rather than I am. I've seen quite a few reviews that had issues with the storyline, but I haven't seen anyone that's posted a completely negative review. I love intense romance and mix in a little science fiction and I'm in heaven. Absolute bliss. Oh gosh Joy, Lieutenant Markov made me all googly love eyed. Same. It was pretty complete, which I loved. But it makes me super curious to see where book two will take place and whether it'll be the same dimension or characters even. I wouldn't say no to more Lieutenant Markov, that's for sure. The cover lures you in, but the storyline is brilliant. You're going to love Lieutenant Markov! You need this book in your life. I shall use my power and demand you buy a copy. Or two. One to stare at the cover while you're reading the other. I love it too. But the difference is this one has a beautiful romance. Two words. Lieutenant Markov. I've seen mixed reviews too, but I love blended science fiction and you know... Lieutenant Markov. Grab a copy and settle in, I think you'll really enjoy this one. Sci-Fi is so not my genre, I only enjoyed some of them. Snd its not even because of the book. I'm just easily bored. But okay, you totally convinced me on this one, Kelly. I mean, I thought the cover was the only thing to praise but I'm so glad that the story is brilliant too. I don't usually read pure science fiction, even watered down young adult, but this was more of a romance with science fictional elements and I loved it. I think you'll really enjoy this one Paula, it's incredible. It was wasn't it. I loved the romance. But I wonder if book two will still be the same characters, or it might be similar to the Starbound trilogy, same world, different characters. I can't wait to find out! So glad you loved this one Kelly! I was hooked by the cover but found a lot of faults with the overall book :( I just couldn't connect with Marguerite and some of the choices she made lacked moral and yea I just can't with her. It's been a great week of books for you! So many 4+ ratings!! I've been picking out all the ones I've been really wanting to read. The four star reviews don't stop there. Next week I have a few five stars and one that was really meh. But it all balances out. I think I might be in the minority with this one, it has it's issues but since I review on entertainment purposes, I absolutely loved it. Lieutenant Markov certainly helped with that though. Did you enjoy the romance side? Parallel worlds are definitely my thing. I read two of em back in 2013 and loved them to bits, and was hoping to get something like that soon. I'm a bit conflicted when it comes to Grey's book, because I've seen a handful of negative reviews, too, although they were mostly complaining about Claudia's apparent "cheating" ??? Not sure :P Will definitely check this out in any case though. That cover is demanding to be read! Mine too Faye and it certainly is. I've seen some that have been a bit wishy washy on this one, but nothing too negative really. Ooh, cheating? That's the first I've heard of that. Do you mean as in cutting corners? Okay, just finished this book like...an hour ago. I LOVED it. Destiny? Alternate dimensions?? BEST ever for me. I am excited to see that ''All Our Yesterdays'' is being held in comparison. I will have to check that one out soon as well.